Time flies when you are a Freemason!! This week my Mother Lodge held its installation meeting. This is a special meeting to install a new Worshipful Master (WM) into the chair, it is also the time when new officers are promoted into their new offices. I was very pleased to become the Senior Warden. I now have a year before I become the WM (hopefully!). We have a great year ahead with lots of ceremonies planned. I am excited about the next job, there is a lot to learn though. I am slowly learning the words of installing my officers. I always look at the amount to learn and have an initial thought of fear. I have to say it is surprising how much you have actually picked up by hearing it so much in the lodge. Learning the other ceremonies will be a challenge. I will probably ask other members of the Lodge to deliver parts of the ritual for me. I think it is important to enjoy your year in the chair and do as much as you can. If it becomes more stressful than fun then there is no point. I think young Masons today have very busy lives with work and family commitments and finding time to sit down with the book a learn is tricky. My advice to new Freemasons would do the best you can and enjoy it. It isn’t the end of the world if you arent word perfect so long as you have tried! This is a photo of our outgoing WM with Jason our new WM and James the Junior Warden. We presented Brian with a cross stitch of the Square and Compasses with the dates of Brians year in the Chair. Normally the WM receives a past masters jewel but as Brian already has one from his last time in the chair we thought we would give him something different. I can remember the evening of my initiation, Brian was the Junior Deacon and escorted me around the Lodge. It was lovely to be stood next to him as the Senior Warden. My year in the chair will be made even more special as my two Wardens James and Simon were both my Candidates into Freemasonry. James was initiated a year after me and Simon the following year. It will be lovely to invest them both. I know the next year will fly by, I hope it doesn’t go too quick!! The 63 Freemasons awarded the Victoria Cross (VC) during The Great War (WW1) will be honoured with special commemorative stones bearing their names to be laid outside the iconic Freemasons’ Hall building in Covent Garden, London. The building is one of the largest peace memorials of our time and was built in honour of every Freemason who fell in WW1. The new memorial was unveiled on Tuesday 25th April 2017. Highlights of the ceremony can be viewed here. The ceremony is not only part of the celebrations to mark this year’s 300th anniversary of The United Grand Lodge of England (UGLE), but also looks ahead to the 100th anniversary of the end of WW1 in 2018. Potts was born on 18 December 1892, and first came to public notice in 1913, when he saved a five-year-old boy named Charles Rex from drowning in the River Thames. By 1915, he was 22 years old, and a private in the 1/1st Berkshire Yeomanry of the British Army. During the Gallipoli Campaign of the First World War the following deed took place for which he was awarded the VC. On 21 August 1915 in the attack on Hill 70, Potts (although wounded in the thigh) remained for over 48 hours under the Turkish trenches with another private from his regiment who was severely wounded, and unable to move. He finally fixed a shovel to the equipment of his wounded comrade and using this as a sledge, dragged the man back over 600 yards to safety, being under fire all the way. He became known as The Hero with the Shovel. He was feted on his return from Gallipoli, the press articles of the time can be seen on the Potts Trust website. In 1967 The Victor children’s magazine told the story very graphically on the front and back covers, it used to feature a story of bravery every week. This article has been used by the Memorial Trust to explain the story at local schools as the graphical presentation, being very much “of its time” appealed to children. The Berkshire Yeomanry Museum website explains the story. Potts was born and raised on Edgehill Street in the Katesgrove area of Reading. After the war, during which he eventually achieved the rank of lance-corporal, he kept a tailor’s shop on the parallel Alpine Street. He was a Mason and in 1934 was Master of the Aldermaston Lodge. Potts died on 2 November 1943 at the age of 50. His grave is at Reading Crematorium, whilst his medals are held by the Imperial War Museum. The man he saved at Gallipoli was a fellow Trooper of the Berkshire Yeomanry called Arthur Andrews who also came from Reading. Andrews lived until 1980, when he died at the age of 89. Charles Rex also survived until he was 87. In 2009, as the result of the production of a BBC Radio Berkshire documentary on Potts, a reunion occurred between the relatives of the two men at the Imperial War Museum. During Prime Minister’s Questions on 20 January 2010, Martin Salter, Member of Parliament for Reading West, indicated that there were plans to provide a permanent memorial to Trooper Potts. It was announced in May 2014 that the memorial would be sited just outside Forbury Gardens, on the open paved area opposite the Crown Court / The Forbury Hotel. The memorials were unveiled on 4 October 2015 by Chris Tarrant and the Lord-Lieutenant of Berkshire, Mr J Puxley. The Trust commissioned “Third Lens Films” to produce a film of the unveiling ceremony. The unveiling was attended by the Provincial Grand Master for Berkshire, Martin Peters, and members of the Aldermaston Lodge. The Government’s Commemorative VC Paving Stone was set in the eastern corner of the 1920s War Memorial. It was unveiled in a small ceremony by Trooper Potts’ Granddaughter – Anne Ames – at 17:00 on 21 August 2015, the exact centenary of the Berkshire Yeomanry’s attack on Scimitar Hill. On 21 March 2016 Greene King opened a new Pub/ Restaurant along the Basingstoke Road, to the south of Reading, called The Trooper Potts. It features two very large displays which tell the story of the rescue and Fred and Arthur’s lives and several smaller ones, including a snakes and ladders board of the cartoon characters “Pip,Squeak and Wilfred”. During the Tercentenary year, the memorial will act as a further reminder of the founding principles of Freemasonry: Brotherly Love, Truth and Relief – UGLE is one of the largest contributors to charitable causes in the UK after the National Lottery. These principles were demonstrated in great abundance by the 63 ‘Brothers in Arms’, Freemasons from all four corners of the globe. The Freemasons being recognised represent an astonishing 1 in 10 of all VCs awarded during The Great War, and that figure becomes 1 in 6 when including those awarded to Freemasons who were members of other Grand Lodges globally. Remarkably, these include three of the famous ‘Six VCs Before Breakfast’ awarded to members of the 1st Battalion, The Lancashire Fusiliers during their capture of ‘W’ Beach at Gallipoli on 25 April 1915. HRH The Duke of Kent, Grand Master of the United Grand Lodge of England, will be officially unveiling the commemorative stones as part of its Tercentenary celebrations, marking the 300-year anniversary of four London lodges coming together to form the first Grand Lodge in 1717. HRH The Duke of Kent attended RMA Sandhurst, was commissioned into The Royal Scots Greys (2nd Dragoons) and subsequently served in Northern Ireland, Cyprus and Hong Kong. He retired from the Army in 1976 and was promoted to Field Marshall in 1993. He has been a Freemason for 53 years and in June will celebrate his 50th anniversary as Grand Master of UGLE. The laying of the memorial stones is part of the Victoria Cross commemorative paving stones programme – a nationwide initiative led by the Department of Communities and Local Government in which every one of the VC recipients of the First World War is commemorated. The initiative aims to honour their bravery, provide a lasting legacy of local heroes within communities and to enable residents and visitors to understand how a community contributed to The Great War effort. “To be awarded the Victoria Cross is the highest honour for bravery and we are immensely proud and inspired to remember our 63 brethren who exemplify the best in men. Its events like this that make me proud to be a Berkshire Freemason. 500 children were given a magical start to the Christmas season by the Freemasons of Berkshire with a visit to the Theatre Royal Windsor on Tuesday 6th December to watch Jack and The Beanstalk. Coach loads of excited children arrived with parents and carers, to be greeted by Father Christmas in the lobby and handed a ‘goody bag’ filled with fun items, the glow sticks being a particular success. Martin Peters, the head of the Berkshire Freemasons, met the guests of honour from Daisy’s Dream, Windsor Family Friends, The Dash Charity, Variety at Work and the Sebastian’s Action Trust together with children from Pathway Special Needs, Addington School, Bourne End Academy and Stony Dean School, Amersham. They all had a great time assisted by the less than elfin ‘Elves’ and willing helpers made up from Freemasons across Berkshire who were directing the children to their seats and dishing out goodies. The cast of Anther Turner as the Fairy, Timmy Mallet as the King, Jason Gardiner as the Giant’s Henchman were joined by Stephen Blakely as Dame Trot and Kevin Cruise as Simple Simon with Luke Harley and Anna Campkin as Jack and Jill. The children provided a great audience, putting as much into the performance as the cast and the noise they made was wondrous to hear! Ice cream for all added to the festive fun and as usual the end of show singing and malarkey was a big hit! Michael Brown, the organiser of the Panto Project said: “The Berkshire Freemasons Panto Project is enjoying its 12th consecutive year. The aim is to give a magical day out for children who are terminally ill, disabled, under privileged, or with educational difficulties. We buy all 600 seats in the theatre and distribute the tickets to the various organisations. The project is funded through the Berkshire Masonic Charity, with help from The Maidenhead Advertiser Louis Baylis Trust, and individual Masonic Lodges and Freemasons from across Berkshire. Mike continued…“We do all the preparation so that all the organisations have to do is get the children here and we all ensure that they have a great time”. No matter how long you have been involved in Freemasonry you will have noticed many changes happening within our organisation. Freemasonry is almost going through a rebrand. We are now very much open to the public and people are becoming more and more aware of our charitable donations and also what we do during our meetings. 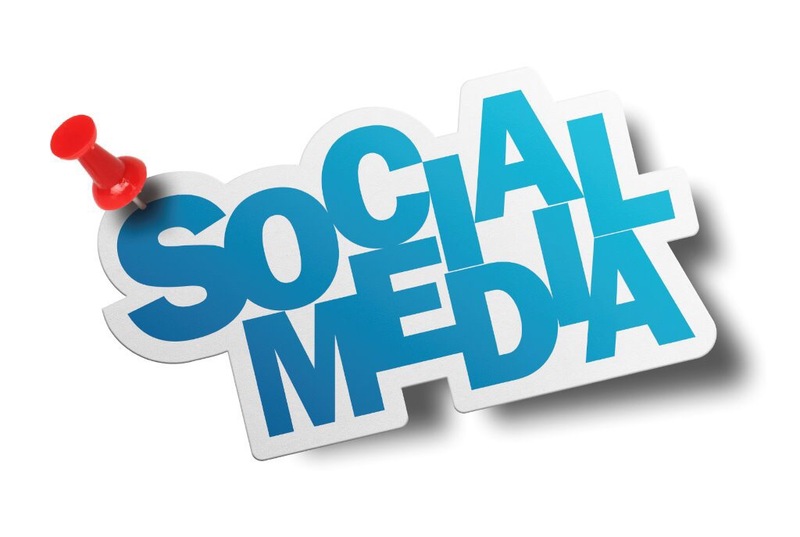 One method of communication that has really taken off is the use of Social Media, namely Facebook and Twitter. I am a keen user of both and manage the accounts of my two craft lodges. I also post on the Berkshire Provincial accounts. I would encourage all lodges and members to use both of these, they are very easy to use and will really help your lodge to gain publicity and hopefully recruit new members. My Mother Lodge (Old Sunning) is a great example of how members and the lodge can benefit. When I joined the lodge many of the members were not used to I.T and certainly not in to social media. The lodge didn’t have a website either. The Lodge had gone through a patch of decline and was almost going to surrender its warrant. The lodge managed to gain two new members who in turn brought many new members to the lodge, I am pleased to say Old Sunning is now doing really well. I mentioned at a committee meeting about social media and a lodge website. At first some of the members were understandably unsure and a bit hesitant about starting any of it. After a bit of discussion it was agreed we would “give it a go”. It has all worked really well and raised the lodges profile and has also produced an easy booking system for visitors to the lodge. Many of our senior members have now joined Facebook and are loving it, I have to say they post more photos and updates than me!! UGLE has produced guidelines on using social media and are encouraging members and lodges to do so. Why not give it a go?? Below is some information about using Facebook and Twitter…. Facebook is probably the most used and well-known form of social media, it is very simple to use and gives you the ability to share your news, photos, videos to friends and family. You can be as public or as private as you like and you can choose who is able to see your information. You can set up a personal page and then separate pages for your lodges or other interests. Again lodge pages can be public, you can also set up private pages for lodge members only if you wish. Below is a YouTube video on the basics of Facebook. The time in Freemasonry does fly past!! At the last meeting of my Mother Lodge (Old Sunning Lodge) I was invested as The Junior Warden of the Lodge. The Junior Warden (JW) is one of the three principle officers within the lodge. As you can see it is a “desk job” with the added bonus of a gavel. It now means I have three years before I go into “The Chair” as Worshipful Master (WM). Its nice to be JW, the amount of ritual to learn isn’t too much actually. This is good as I am now trying to get my head around the WM work. Two years in Freemasonry goes very quick!! Learning the Masters work isn’t easy. I have taken lots of advice from various people on how to tackle it. Im getting familiar with the installation work at the moment and investing the officers. I will then work on the other ceremonies. I am looking forward to a trip to Grand Lodge with the WM and the Senior warden to represent the lodge. I have been once before as a Master Mason, will be nice to go as a Warden. 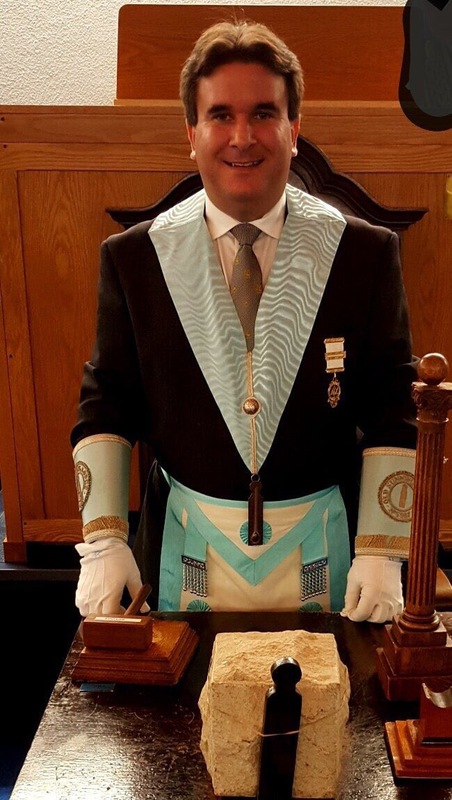 Last night was my first Lodge of Instruction as JW. We went through the work for the next meeting, this will be a Second degree or a Passing as it is also known. I do enjoy our LOI’s, it gives us a chance to practice the work. We have a great balance or learning and fun and of course a catchup with the lads in the bar afterwards is always great!! So now im off to do a bit more reading, catch you soon!! than the wearing of a pin. this does not mean a thing. the world that you belong. the things you learn within. and assist him when in need. that the world without can see. your’re a Mason and a Man. This poem was penned by a Brother C. E. Reynolds and thought I’d share. I have joined another Masonic Order. 1st June I joined an order known as Rose Croix. Its official title is Supreme Council 33° of the Ancient and Accepted Rite for England and Wales. Rose Croix is a Christian order. The ceremony was beautiful and every member who took part in the put in so much effort to learning the ritual. I joined The Thames Chapter in the province of Oxfordshire (It actually meets at Caversham) with the aim of being able to venture out my main province of Berkshire. The chapter is a very friendly and relaxed. I had a great night ending with a very fun and informal meal. I am looking forward to visiting other Chapters and progressing through the degrees. Of all the many orders and degrees outside the Craft and the Royal Arch, there is no doubt that for many the pinnacle of their Freemasonry is membership of the Ancient and Accepted Rite. The 18º is the one ‘beyond’ the Craft that they would be most reluctant to lose. It is very rare to hear any member speak lightly about the Rose Croix. They are right to value it so highly. The degrees beyond the Craft are many and varied. Whilst there are ways of classifying and grouping them together, there are those referred to as Christian Orders, in that they restrict their membership to those avowing the Christian faith. These include the Knights Templar, the Red Cross of Constantine, Knight Templar Priests and the Royal Order of Scotland. Perhaps the most well known is the Ancient and Accepted Rite of 33 Degrees working under the Supreme Council 33º, based at 10 Duke Street St James, London. It is the 18º, ‘Knight of the Pelican and Eagle and Sovereign Prince Rose Croix’, or simply Rose Croix, which is the most spoken of and while masons outside the Order may know little else of it, they appreciate that it is highly prized. I must, however, caution masons from rushing into the 18º or claiming to be a Trinitarian Christian if they do not fully understand that doctrine. Being an occasional churchgoer will simply not give that comprehension. The Rose Croix is not a badge to be collected, nor indeed are any such Orders; Rose Croix Chapters choose their candidates with great care. The ceremony demands real thought and Christian understanding before undertaking it; thus for good reason, membership of the A & A Rite should ideally be by invitation. However, rank in the Craft or other degrees should also have no bearing; a mason’s self-awareness and Christian faith is not measured by the size or ornamentation of his apron. The History of the Rose Croix and its antecedents is complex. Any summary such as here will leave out an enormous amount of detail! The Rite was allegedly constituted by Frederick II (the Great) of Prussia in 1762, but there was certainly some form of Rose Croix – encompassing a whole host of prior influences from the Renaissance, Kabbalah, Rosicrucianism, and Enlightenment thought – being conferred in France by the 1760s. Variants of the degree arrived in England in different forms and by the 1770s the Rosae Crucis degree was being conferred in Knight Templar Encampments – now called Preceptories. The superbly named Dr. Crucefix, a mason with a considerable interest in degrees outside the Craft, obtained a patent from America backdated to October 1845 and he, along with other Knights Templar, formed an English Supreme Council. The story from there on is one of this Supreme Council taking control of the Rose Croix and persuading the Knights Templar to give up their Rosae Crucis ceremony along with another form of the degree now called the Knight Kadosh (the current 30º), then often referred to as ‘Ne Plus Ultra’ (‘nothing higher’), while at the same time warranting chapters of its own. My own Chapter – then Metropolitan and now Grand Metropolitan – was formed very shortly after the patent issued to Supreme Council and for some considerable time was used directly by Supreme Council to induct suitable brethren on its behalf with members of Supreme Council actively involved in these ceremonies and in the day-to-day business of the Chapter. England’s Supreme Council today has come a long way from that early ‘Scottish’ or ‘Ecossais Masonry’ (hence in the USA and elsewhere these degrees are often referred to as the Scottish Rite) in the politically charged Europe of the Eighteenth Century. Of the 33 degrees, only five – 18º, 30º, 31º, 32º and 33º – are conferred in full on candidates with the latter four being reserved for those Princes (the word for 18º masons) who have served the Order with distinction. The first three degrees of the Rite are considered to be equal to those of Craft masonry and so prior to being ‘perfected’ in the 18º, the ‘Intermediate Degrees’ from 4º to 17º are conferred on candidates by name; the same happening with the 19º – 29º before receiving the overtly templar Kadosh 30º. One or two of these degrees are staged annually as demonstrations and very interesting they are. However, the fact that there are degrees numbered ‘above’ the 3º of Master Mason should not lead one to see any of them as ‘higher’ than the Craft. They have little bearing on the 18º itself, except in tracing the candidate’s progress from symbolic, Old Testament masonry to that of the New Testament era and the New Covenant which is at the heart of Rose Croix. For such masons, the level of thought has moved on to encompass the life and message of Christ, but one should not think in terms of higher degrees or, worse still, of greater rank or promotion. 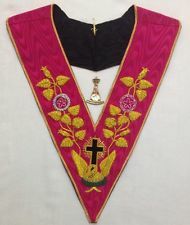 Although no fan of regalia myself – so often the jewels, sashes, aprons, and collarettes seem with their emphasis on rank and status to get in the way of what the degree is really about – the rose-pink collar of 18º is not only beautiful, but conveys many of the lessons of the degree. Embroidered with key symbols – the Rose, the Pelican in its Piety, the Crown of Thorns, the Serpent – it serves the ‘perfected mason’ as a wonderful aid in the teaching of Rose Croix and is used as such in the ritual. Many regret the passing of the beautiful aprons with the tetragrammaton within a blazing triangle and, once again, the pelican’s mythical vulning of itself to feed its young with its blood in allusion to the ultimate sacrifice of Christ himself. As to the abolition of the aprons in 1978, some cite their expense, others the inappropriateness of knights of a Christian Order clothed in aprons originating in the Operative past. However, one cannot but envy the Baldwyn Encampment stationed at Bristol who still proudly wear them. In the ceremony the Candidate is taken from room to room figuratively through his spiritual and masonic life from Solomonic Masonry, through despair, to a Rose Croix Chapter and the discovery of the Lost Word. At the start, he is figuratively but a 17º mason, a Knight of the East and West, of symbolic age, coming – as the ritual explains – at a time of dire calamity with but incomplete pre-Christian knowledge. Following perfection, the ensuing “feast of fraternal affection” is a wonderful moment of shared Freemasonry all too often lost in other degrees. That this 18º is special is not in doubt for those on whom it has been conferred. In Bristol, the members of Baldwyn have their own version as the pinnacle of their unique Rite of Seven Degrees.